Being a port city, Yokohama's night views complemented by reflections to the ocean and its skies are beautiful. 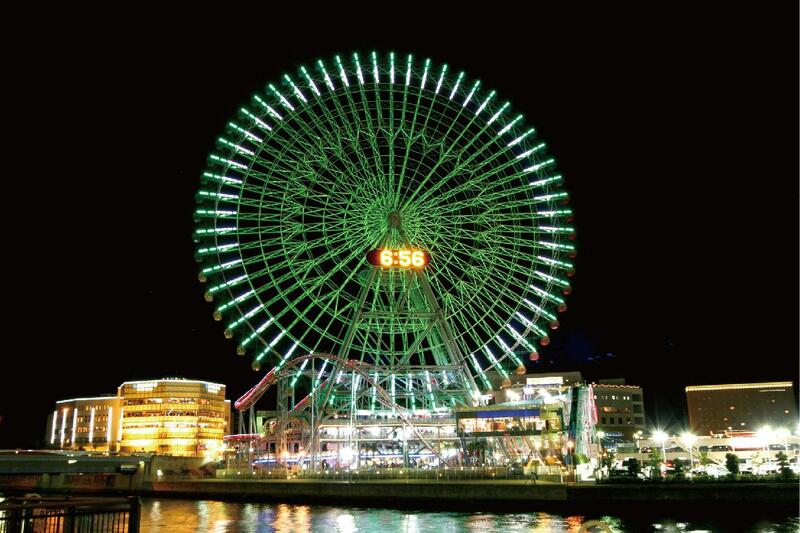 For those who to enjoy Yokohama's sparkling night views. The City of Yokohama has continued to promote the lighting up of various historic buildings since 1988. Enjoy night views of classic architectural beauty. Kanagawa Prefectural Government’s Office, also known as the “King” from its majestic features. The Kanagawa Prefectural Office built in 1928 boasts an Imperial Crown Style structure, fusing oriental and occidental design. The building earns its nickname the “King” from its stately presence. The “King” was designated as a tangible cultural heritage building (night time light ups are only on Fridays and weekends). Popular as a shooting location for dramas and movies. Yokohama Customs Office, also known as the “Queen” for its curved lines. Yokohama Port Opening Memorial Hall, also known as the “Jack”. A building in the neo-renaissance style that opened in 1918. The tip of the clock tower is lit with lights that over-pass the intersection. The lightshow on the red bricks takes you back in time to a different age – Yokohama in its golden era. The orange reflection from the lighting on the bricks is superbly beautiful, and is bound to make you smile. 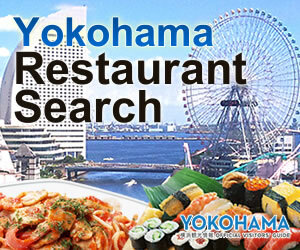 It is close to a Minatomirai Line station, making the building a good starting point for visiting Yokohama night views. Also nominated as a “Japan Heritage Night View”. Yamashita Park, Yokohama’s most famous park. The most well known park amongst all the parks that opened in 1930. The illuminated ship Hikawamaru, Yamashita wharf to the right hand side, and the Osanbashi Yokohama International Passenger Terminal to the left. Recommended view spots are the central plaza or in the India Water Tower area. The light from the Osanbashi and Hikawamaru reflect and mingle beautifully on the ocean surface. The view from the park is designated as a “Japan Heritage Night View”. Legend goes that after viewing all “King”, “Queen”, and “Jack” from the three places that allow you to see them at the same time, your wish will be granted. There are two stories that became the basis for this legend. The first involves a foreign sailor who prayed for safe seafaring with all three towers in view. The other praises the sturdiness of the three towers that withstood the Great Kanto Earthquake, and those in difficult relationships seek the buildings for moral support, paying homage to symbols that have endured hardships. – Both stories are quite charming. With great music and great food, the Alte Liebe is a French restaurant located in a luxuriously styled heritage building. You can spend quality time at a leisurely pace. The 180 degree panorama view from the 13th floor spans Yokohama Port, while you enjoy the fantastic casual French dining. The perfect restaurant for a classical Scandinavian cuisine. The first floor is casual. The second floor has a formal feel with sculptures on the wall – you can choose according to the occasion. You can see the Yokohama Port Opening Square from the 2nd floor seats. A must try dish is the 3 hors d’oeuvre with marinated herring. The restaurant is situated inside the hotel, which opened after the Great Kanto Earthquake in 1927 along the coastline of Yokohama (where the damage was most severe) as a symbol of recovery. The wooden interior emanates warmth, providing customers with a relaxed atmosphere. “Western food” or western cuisine adapted to Japan such as the “Spaghetti Napolitan” and seafood doria are said to have been first served in this restaurant. The restaurant is also open for tea and light meals, making it a convenient and fully satisfying dining experience. The charm of Minato Mirai is definitely in the beautiful scenery of high-rise buildings alongside the waterfront. The natural light shows make for spectacular night views. This park is located beside the Yokohama Red Brick Warehouse complex by the sea. The Red Brick Warehouse complex has a different allure at night when lit up. The lighting The scenery has caught the attention of directors for many TV dramas, movies, commercials, and PVs as a perfect shooting location. The Bankokubashi is a concrete arch bridge built approximately 70 years ago. The surface of the canal reflects the light from the Yokohama Landmark Tower and Queen’s Square Yokohama. Views from this bridge are also popular as shooting locations for TV dramas and movies. This walkway was built on the remains of freight train tracks that lead to Yokohama Port. The walkway extends 500m from Nipponmaru Memorial Park to the Shinko district. You can enjoy the reflection on the water as you walk alongside the canal. There are benches on the walkway that allow you to enjoy night views as well. Rinko Park is the largest park in the Minato Mirai district with a full view of Yokohama Port. 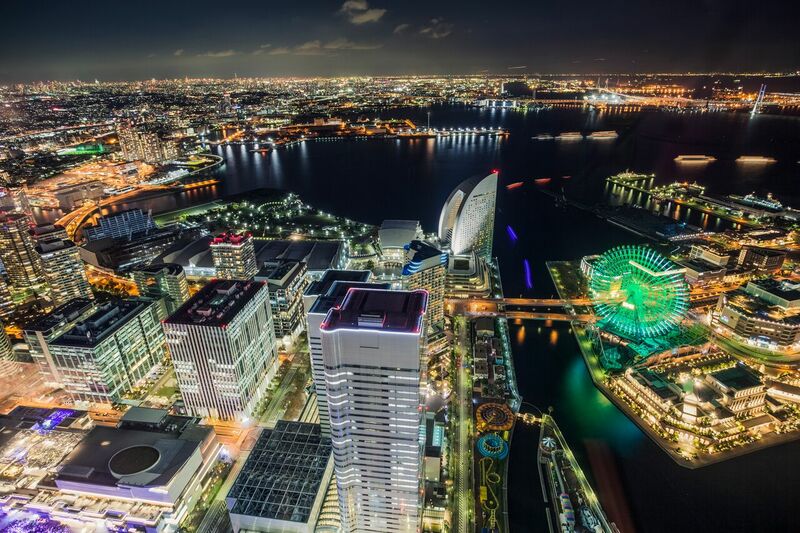 The park boasts a fantastic night view of the Minato Mirai area beyond the curving coast line. A huge seaside park that immerses you in beautiful scenery while feeling the see breeze. The balcony seats with a night view are recommended. In front of you is the sea, and to your left is the Ferris wheel. See 100kms of night view spanning the Kanto plains spread out in front of you at the pair seats. The 69th floor (observation deck) of the Yokohama Landmark Tower has a cafe with pair seats facing the windows. Sipping original cocktails and good wine while viewing the reflected illumination on the sea surface below is just superb. A classic bar situated within Navios Yokohama. You can enjoy reasonably priced cocktails – without any cover charges. The blue lighting in the bar creates a dazzling contrast with the warm colors reflecting off of the lit Red Brick warehouses. Beyond you can enjoy night views of the Great Pier and Yokohama Bay Bridge. The bar is spacey, and provides a beautiful night view from every seat. You can also play billiards with the illuminated port city on your back! 3: Enjoy the night views from a foot spa. The Manyo Club is an all-in-one facility that provides a quality onsen, food, beauty parlor, and rest place. 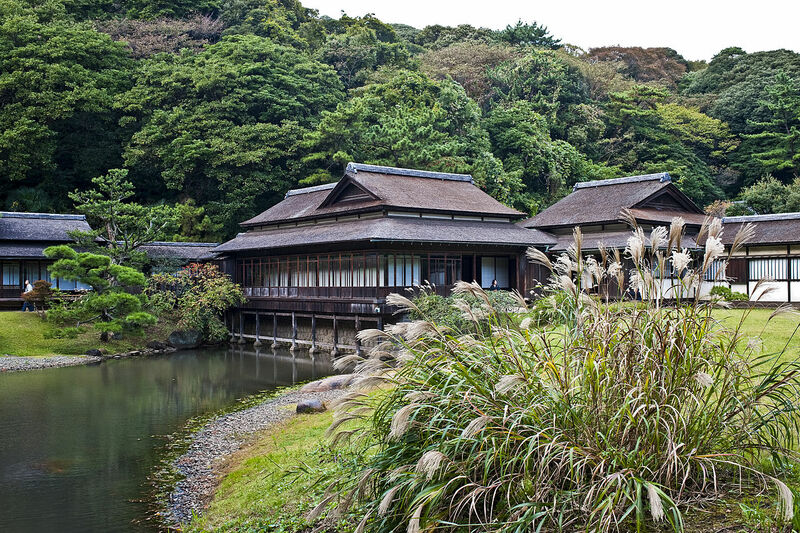 An outdoor onsen, hinoki-buro, great bathhouse, and a variety of unique baths in addition to a restaurant, beauty parlor, massage salon, and hotel facilities are available. The rooftop foot spa provides a panoramic night view of Yokohama Port. Ladies get to enjoy 9 different types of yukata to choose from while in the facility. After going on a tour for night views, the last item on the menu should be – the best night view of all. Recover from your travels and rest amidst the Yokohama night views. The hotel overlooks a luxuriant park as well as the Yokohama bay area. Comfort and harmony are apparent in the 480 spacious and carefully appointed gust rooms and suites. Seaside rooms open up onto balconies and gentle ocean breezes. From luxury ocean twin room, the privileged traveler could admire a unique view of the Yokohama port and illumination of the Ferris wheel. Dining is a gastronomic excursion through a world of culinary delights. The hotel not only offers all the facilities and convenience of a city hotel, but also provides a delicate ‘resort touch’ with genuine and personalized hospitality. Situated conveniently, close to Yamashita Park, shopping venues, and dining restaurants. The views available from the twin rooms on the sea-side provide you with stunning images of the Bay Bridge reflecting on the sea – a special feature of Yokohama.